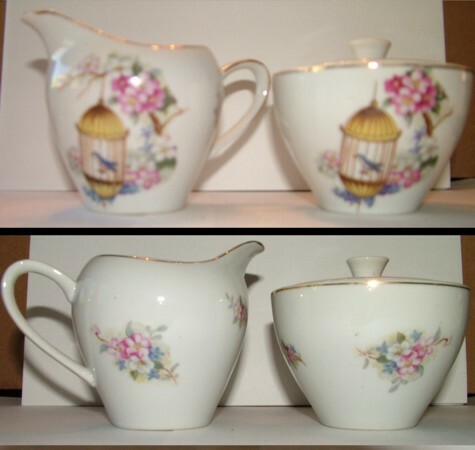 This is a cream pitcher and sugar bowl for a tea set. They are porcelain and have no maker's marks. They have a gold line detail along the rim and on the lid and handle. They both have the same decor which appears to be applied with a decal technique - they are not hand painted. The design shows white, pink, and blue blossoms on tree branches,. A gold birdcage hangs from the branches and contains a blue bird. This little tea set is well over 30 years old. Both pieces show signs of wear, but are in good condition. There are no chips that I can see. 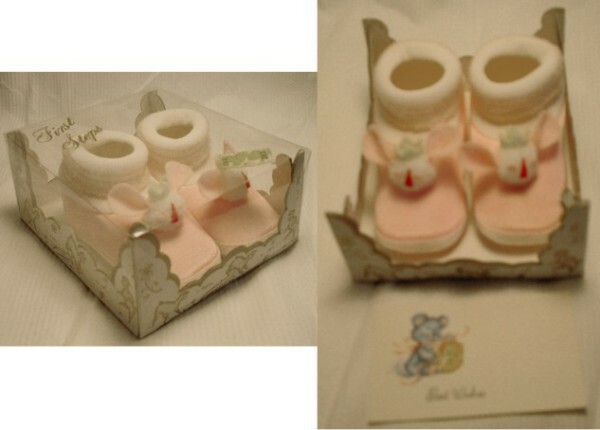 These adorable little baby shoes are still in their original box and look brand new. Inside they have a label that says "Size 0 Baby Shoe - Japan". There is also a little card with a bear holding a gift that says "Best Wishes". The shoes themselves are made of a shiny pink material and are decorated with a pom-pom mouse head on each shoe. The mice have pink eyes and ears and a red triangle shaped nose, and both wear a yellow crown. There is no maker's mark. The box they came in has a cardboard base, colored white and decorated with gold sheep and flowers. The box top is plastic and is broken at one edge. The words "First Steps" are printed in gold on the box top. The entire box shows signs of aging and wear, but the shoes have never been used.